Coffee and cakes courtesy of the Horsham Quakers. 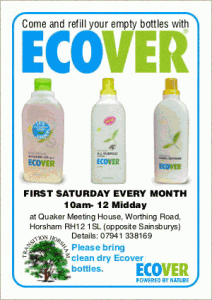 Location: Quaker Meeting House, Worthing Road, Horsham, RH12 1SL. The Sussex Green Living recycled stand will be there selling beautiful merchandise made by ex landfill families in Manila, Philippines, the perfect Christmas presents. Our main aim is to raise the profile and money for the Philippine Community Fund, through selling their upcycled merchandise. The proceeds from PCF goods will go towards healthcare, training and education for over 800 children in the Philippine Community Fund school. We will be selling jewellery, bags and purses are made out of our waste resources (aluminium ring pulls, fruit juice pouches, crisp packets and glossy paper). Over the last month Manila has experience more floods than normal, but has not been as badly hit as the areas further south, never-the-less they are in desperate need of funding. Also for sale kitchen and garden goods made out of recycled materials, toys and books educating children about recycling, climate change and our precious planet. 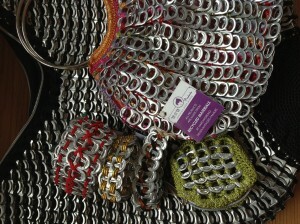 Examples of some of the products can be seen here. You can also refill your Ecover cleaning products, don’t forget to bring your empty Ecover bottles (although there is a limited supply of empty bottles). Other attractions will include Amnesty card signing and Fincalink Spanish olive oil cooperative. No parking available. It is opposite Sainsbury’s car park. For more information contact Carrie by email or call the Horsham Quakers on 01403 252309. More information about the Horsham Quakers and their forthcoming events can be found here. 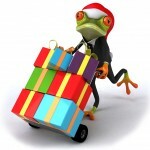 Come for a coffee and a cake, have a chat and buy some ‘Green’ Christmas presents. Please bring a friend or two. This entry was posted in Events, Green stats, facts & news, Green Suppliers. Bookmark the permalink.